Today we are visiting the Northern Cape Town of Springbok. It lies in a narrow valley between the Koperberge or Copper mountains. Copper was first discovered in the area by Simon van der Stel the then governor of the Cape in 1685 but commercial mining only started in 1862. The first copper mine in Springbok and the first commercial mine anywhere in South Africa was known as the Blue Mine and can still be seen today. 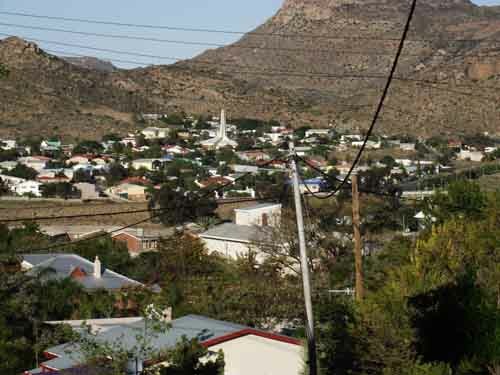 It is situated to the west of the town and a visit to the mine gives you good views over Springbok. Around the mine which is fenced off there is a short walking trail for those who like to hike. I however found the rock formations in the mine a lot more interesting than the walking especially as one could plainly see the copper in the rocks where it had turned a turquoise green from coming into contact with oxygen in the air. The rock formations in the Northern Cape can be quite interesting and the scenery is nothing like you would experience in Cape Town. 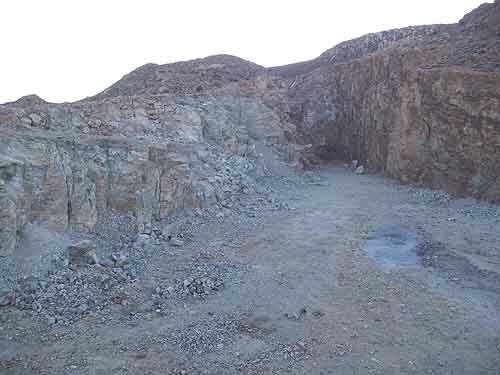 The hilly outcrops you find scattered around are made up of plenty of loose rocks and dolerite and in certain instances look like they have been gathered up and placed in heaps like a farmer would do when he clearing his fields of rocks. In other areas it looks like the mountains have been blown up as there are thousands of bits and pieces of rocks lying around. 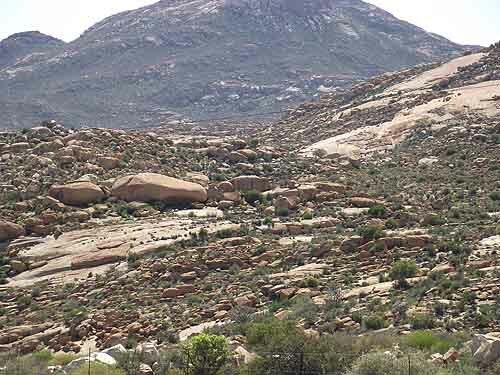 One rock formation on the road between Springbok and Pofadder looked like a monster mole had been at work. The rocky hills looked like mole hills and were pushed up every hundred metres or so more or less in a straight line just like a mole would do them. All around the hills was flat red ground and no rocks at all. I actually enquired to find out if the hills were man made and was told that the formations were natural. 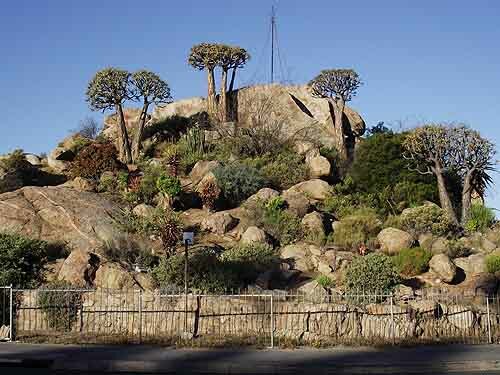 In Springbok itself there is an interesting koppie ( rocky outcrop) in the middle of the town which has a number of monuments around it. During the Anglo Boer War 1899-1902 .the British used this hillock as a fort much to the chagrin of the Boers. The Boers under General Smuts eventually sneaked up on the fort and dynamited it thus securing a victory over the British garrison in Springbok. During the 1870's copper in large quantities was discovered just north of Springbok and a small town named Okiep was established in the area. Many miners flocked into the new town but eventually had to give up as there was no drinking water in Okiep. 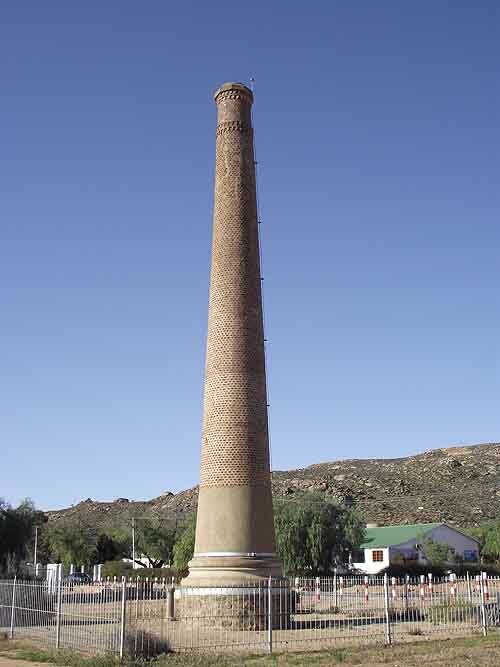 Springbok was the nearest supplier of drinkable water in the area so it became the centre of the mining industry in the Northern Cape. Today there are a number of historical relics left over from the copper mining era in and around Springbok. The first is the old smelting furnace, which can be found just north of Springbok and today is the oldest of its kind in Southern Africa and has been declared a national monument. The smelter has not been used since 1871. The old mineshaft dug by Simon van der Stel way back in 1685 can also still be seen to the east of Springbok at place called Carolusberg. In Okiep there is an old smoke stack that was built by the Cape Copper Company in 1880 and was used as a ventilation shaft for the mine. It has also been declared a national monument. 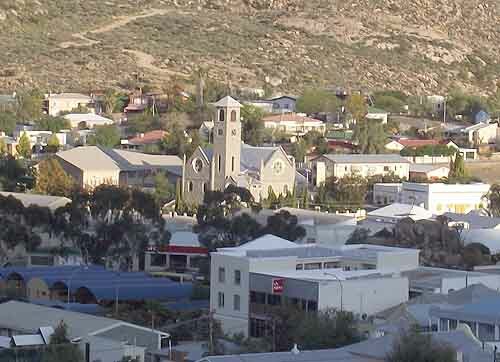 Some of the other interesting old buildings to be seen around the town of Springbok are the old Klip Church ( a Dutch reformed church) built in in 1921 out of rocks mined in the Blue Mine. This church has been declared a national monument. There is also an old Anglican church as well as an old Jewish Synagogue which is used as a museum today. 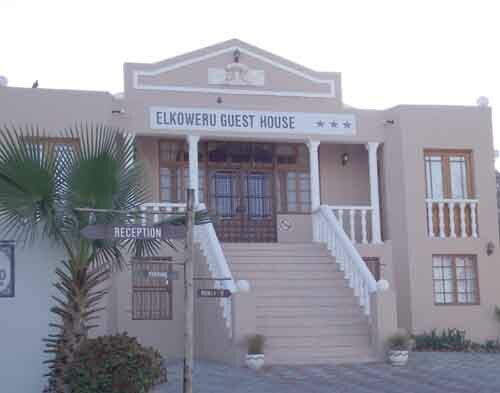 On our trip to the Northern cape we spent two days visiting Springbok and utilised the Elkoweru Guest house to stay in. Prices were reasonable and the place was kept neat and tidy. This strange name is made up of the first two letters of each of the owner's children's names. On our first evening in the town we went for a walk through the town to do some exploring and were quite amazed at the lack of people on the streets after 5.00pm. As is usual in any country town there are normally a couple of drunks lying around or bothering people but other than them one felt completely safe when walking the streets. One thing however that we noticed was that most people had installed burglar bars and high gates and walls to protect themselves. Something that is needed in the big cities but not necessarily in the smaller towns such as Springbok I would have thought. The town itself was pretty clean not like some of the other towns we visited further north. On our walkabout of the town we decided to have a meal at one of the local restaurants and when our chicken schnitzels arrived were completely amazed at the size of the plate and the portions of food we got. 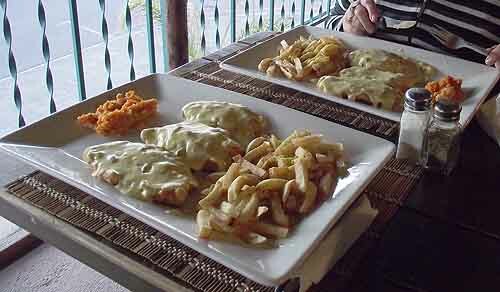 Unfortunately we could not do the portions justice and had to take a doggy bag home with us. The price was very reasonable if compared with what we would have got for the same price in Cape Town. Springbok being the last big town before the Namibian border gets many tourists passing through it and is an ideal stopover before taking on the long distances and dead straight roads through the deserts of Namibia on your way to Windhoek or other Namibian towns. For people travelling to the north I would recommend that they stop over in the town as taking on the deserted desert roads at night could be pretty dangerous especially as wild animals stray onto the roads at night. Springbok is worth a visit especially if you are interested in the history of copper and the flowers that occur in Spring after good winter rains.